3 Where do you start creating a workout plan? Life is continuous and complete. Plans designed in isolation disregarding the continuity of life have limited benefits and reduced longevity. Continuity of life may seem an esoteric concept on the surface until we look at the role it plays in everyday life. Let’s look at workout plans and posterior chain exercises as an example. How often have you looked for or heard of workout plans for the upper body, for the lower body, to lose weight, to gain strength, to rehabilitate knee, lower back or shoulder? Each workout plan designed to address one of the examples designed in isolation and could easily miss something else within the continuity of physical body. I have watched many chasing their pain through their body from their feet, to their knee, then their back followed by their neck and shoulder. And then they start all over again or they settle with the idea of pain or low performance is natural. Body cannot be isolated to its individual parts like ankle, knee or lower back. Just like your identity that cannot be limited to the role you play in life, your relationships and even your thoughts and emotions. You are a complete entity and your body is a complete unit. I have listened to clients come to me for help in losing weight or building muscle. These two are not separate objectives. To answer the question of how to create a workout plan? We need to include the larger picture as well as the details. For decades, I have seen thousands of exercise programs for upper body, core, lower body promoting the belief that somehow the body could be divided in parts. Many of these inefficient planning steps arise from lack of information that could easily be fixed. Methodical gathering and application of information requires your direct input and patience. Once you establish a foundation in anything including the way you workout, then continuous stream of marketing material promoting the latest workout routine would lose its luster. Gathering practical information and learning to work with them is time consuming. What seems to be a shortcut ends up taking more time in lack of results, do-overs and injury recovery. When you look at the need for the foundational information regarding any aspect of wellness, health and physical performance over a lifetime, the learning curve becomes an investment that pays years of dividend. You can take the time and learn a system and benefit from it for a lifetime or you can take years working with bits and pieces of disjointed information and never enjoy the benefits of having a complete and effective system. Where do you start creating a workout plan? A good start to create a workout plan is to with basic understanding of the anatomy of the body and the tension lines within the anatomical structures. These structures work together making up continuous muscular chains. As I said, life is continuous. Anatomical structures responsible for your motions that create these tension lines include bones, muscles, connective tissues, joints, tendons and ligaments. One of the most significant of these tension lines that contribute to your mental outlook, self-confidence, posture, strength, stamina and mobility is posterior chain muscles. The word posterior refers to “in the back” or closer to the back. Posterior chain muscles begin under your feet, pass through your heel on the way to your skull. Your calves, hamstrings, glutes, lats, and neck are part of this chain that crosses over in part at your lower back with many attachments to the side of your skeletal structure. Effective posterior chain exercises work the entire tension line and exercise the muscles in the chain together and not in isolation. 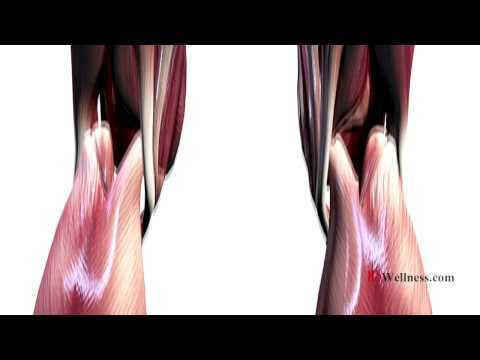 The video below shows you these muscles so that you can have a visual for them. Energy in motions transfers from the ground up. Inefficiencies in the posterior chain muscles around your foot and ankle, harms your ankle. Your calves and hamstrings along with other knee stabilizers are in the back of your legs and wrap themselves around the knee joint. Imbalances in these areas harm your knees. Your glutes are the powerhouse of your muscular strength, stamina and mobility. Those who age and lose glute mass, lose mobility. Watch most who age and you will see how flat their glutes have become. Loss of mass and control over your gluteus shows up in knees and lower back. Your ability to stand, bend and lift rely on the stabilizer muscles in the back around the spine. When these muscles are imbalanced, they contribute to low back instability and pain that transfers to neck and shoulder. Pause the video in area related to your current goals and see how the muscles in that area work together with the muscles below and above that region.